Here we go. Geeky techy post again. Prepare to drop off to sleep at any moment. My previous post was about ordering a Synology NAS device. I’m pleased to report that the hardware doesn’t disappoint. It was simplicity itself to set up. The drive bays in this particular unit have plastic strips down each side that you remove, insert a hard drive and then replace (not all Synology NAS hardware is like that). No need to screw the hard drives into the caddy although you can if you wish and there are screws in the box for this purpose. The 1513+ has lockable drive bays not present on the 4-bay unit I was considering. Nice to have. Once inserted I plugged the NAS into my router and then turned it on. You simply navigate to find.synology.com in a web browser on your network and then your NAS is found and the installation of the operating system begins. This took about 10 minutes for me, although I am on fibre broadband so the download stage was pretty quick – it could take a little longer if you’re not so lucky. Amusingly, the installation screen said “This will take about 10 minutes. Go and have a cup of tea.” I willingly obliged. Once I’d finished my nice cup of rosy, I could log in to the Synology Disk Station Manager software (currently at version 4.2) and begin to configure my system. Meanwhile, the hardware was running a consistency check on the disks (this took about 10 hours, but naturally largely depends on how many disks you have, their size and speed). After this there was an optimisation of the disks which took another couple of hours. You can use the Synology during this time although performance may be a little slower than you would otherwise expect. I quickly set up shares, users and permissions and also configured a Time Machine share. Synology recommend you create a Time Machine user with a quota, thereby enabling you to limit the size you want to apportion to TM backups. I was very pleasantly surprised to find that the Synology Time Machine share instantly appeared as an option in Time Machine on my Mac without the need to mount any drives. I can only assume it works the same way as a Time Capsule – in other words, it “just works”. I was also able to select my NAS as a Time Machine disk for my wife’s ancient first generation MacBook laptop which is running Snow Leopard (it won’t run anything more recent). As that device only has a 100Mb ethernet port and is connected via Home Plugs the 55GB backup from there took longer than the 400GB backup from my Mac Pro (see my forthcoming post about network changes I’m making). I’ll comment more on the NAS’ performance in a future post because at the time of writing I’ve only just got it hooked up to a full Gigabit infrastructure. I can report that noise levels are pleasingly quiet. I can hear it, but it’s really not that loud at all even though it’s sat about 5 feet away from me as I type this. I’ve only filled 3 of the 5 bays in this NAS. The reason I bought one with 5 instead of 4 or even 3 bays, is that as I’m using RAID I immediately lose space for redundancy and will likely fill up the 6TB of available storage in the fullness of time. The remaining bays will give me some room for expansion as well as the option to set up a hot spare should I ever need to. The 1513+ is also compatible with expansion bays Synology sell so I really shouldn’t run out of room to store my data any time soon. In summary. It’s early days. I’ve only had the NAS for 4 days and at the time of writing it’s only been on a Gigabit network for the last couple of hours. I also haven’t put much data on it yet (and there’s a good reason for that which I’ll talk about more next time) but first impressions are good. I’m already delighted with my purchase and the way that my new-look network is shaping up. This entry was posted in Computing, Hardware, Technology on August 24, 2013 by AJClayton. Geek alert! This post is about my home network so if that leaves you reaching for the hot cocoa and your duvet then look away now. It seems like not long ago that if you had a home computer that was all the computing tech you would ever need Even when we started connecting to the internet (first with dial-up and then broadband) there wasn’t any great need for a home network – that was something we left to businesses to worry about. There were several problems with the Buffalo Linkstation. First of all, it was noisy! Secondly, the 10/100 ethernet connection was a bit slow for everyday use. I soon gave up on the idea and used this item for backup instead. For a while. Now it sits in the hardware graveyard as one of those ideas that never quite worked properly. There have been a few of those over the years. Coming up to date my network has grown, as I predicted it would, and am I running out of space on my main computer. My internal Time Machine backup disk is too small to even take a single snapshot plus my boot drive keeps filling up and my data drive is rapidly diminishing in size too. I plan on upgrading to the new Darth Mac (Mac Pro) as soon as it comes out (unless it’s too expensive) but whatever Mac I end up getting it won’t have enough internal space to store all my data. For the last few weeks I’ve been re-investigating NAS storage which has moved on quite a lot since my first foray into this area. 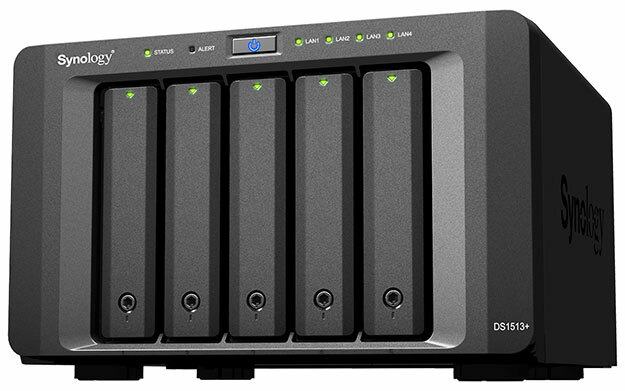 After considering several different manufacturers and models I eventually decided on the Synology DS1513+ 5-bay NAS unit (see picture). I ordered it today and it will arrive tomorrow. I’ll post more about the unit as I get to grips with it, but suffice to say that it’s a world apart from the Buffalo device. First of all, it’s a 5-bay unit into which I’ll be inserting 3 3TB Western Digital Red hard drives giving me 2 bays for future expansion. This device is not a passive piece of hardware. It’s a full blown computer, coming with an embedded Linux operating system and can act as everything from a media server to a web server to an FTP server, mailserver, cloud server and lots more besides. Synology also supply a few iOS apps to enable you to access your data remotely as well as stream media. This is the first step on the road to re-organising my data and preparing for my new computer. Future steps include moving my wife’s data from her laptop to the NAS as well as upgrading the router (or adding a switch) to give me full gigabit ethernet speeds across the network. This entry was posted in Computing, Hardware, Technology on August 19, 2013 by AJClayton.